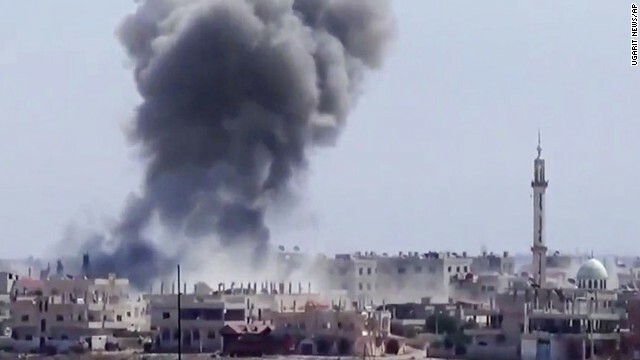 Intelligence increasingly shows al Qaeda is encouraging American and other western fighters in Syria to undertake special training to prepare them for possibly returning to their home countries to carry out attacks, U.S. officials told CNN. National security officials are concerned that amid the mayhem of Syria's civil war, the global terror group has found a safe haven and a place where it again can recruit, plot and train operatives to carry out attacks on the U.S. homeland. "There is an effort to exploit them to get them to return to the West," one official said. The official, who did not speak for full attribution, described scenarios in which foreign fighters arrive in Syria and are recruited by al Qaeda to train for external attacks. CNN has spoken to a number of officials who sketched out similar scenarios. It is not certain how many Americans may have been singled out or if any have been successfully recruited. But another worry is that any Europeans in the mix may be a potential threat as well because they don't need visas to enter the United States. Training facilities can change locations and related materials can be found online, minimizing chances that a specific target could be identified and attacked. Another concern is the presence in Syria of fighters and operatives affiliated with Al Qaeda in the Arabian Peninsula (AQAP), which is based in Yemen. Its top bomb maker, Ibrahim al-Asiri, is believed to have developed underwear bombs and an explosive hidden in printer cartridges. Just this week, U.S. authorities warned airlines about possible shoe bombs. One law enforcement official said recent intelligence points to tactics believed to be tied to al-Asiri. There is concern that new bomb-making skills could be passed along to those already receiving training in suicide bomb attacks. Even if attacks against the American homeland are not imminent, officials say new training in Syria could present a longer-term concern if potential terrorists return with new training and wait to make bombs or mount an attack. The United States estimates up to 70 Americans have traveled to Syria, many with the purpose to join extremist groups. U.S. homeland security and intelligence officials are trying to track them entering Syria and hope to do so, if they return to the United States. Department of Homeland Security Secretary Jeh Johnson earlier this month called Syria a "homeland" security threat, reflecting a more direct concern by Obama administration officials who previously described the war-torn country as a regional threat that impacts U.S. national security interests abroad. "We are focused on foreign fighters heading to Syria right now. Based on our work and the work of our international partners, we know individuals from the U.S., Canada and Europe are traveling to Syria to fight in the conflict," Johnson said. "At the same time, extremists are actively trying to recruit westerners, indoctrinate them, and see them return to their home countries with an extremist agenda mission," he added. Johnson made those remarks within hours of returning from Poland where European Union ministers met specifically to discuss foreign fighters traveling to and from Syria. Director of National Intelligence James Clapper raised the issue as well in recent testimony before the Senate Intelligence Committee. "We're seeing now the appearance of training complexes in Syria to train people to go back to their countries, and, of course, conduct more terrorist attacks," he said. But officials told CNN the public comments only begin to address concerns growing within U.S. and European intelligence agencies. Of course they are why wouldn't they be they live amongst us yet we don't want to take the proper measures to get rid of them . I ask you how many more of our finest sons and daughters and then their children will somehow be coerced and convinced or ordered to become brave soldiers in order to pass one of the entrance rites to adulthood? I ask you how many more of our world citizens will somehow be coerced and convinced or ordered to go to war to kill other equally perfect human beings? Most people have been indoctrinated since birth by government, church, family and friends that “Thou Shalt Not Kill,” except in wars. It often appears that our morality still changes to suit the needs and desires of the moment. and then spread your crimes with wars. The best counterattack is to send radical Muslims an Army of Jehovah's Witnesses, Mormons and Hare Krishna. Islam is the root of all evil. Unless there is a massive conversion of Muslims to Christianity, nothing is going to change. The "Satanic Verses" of the Qu'ran and prophet Mohammed's highly immoral, perverse, cruel and discriminatory conduct will continue to be the role models for millions of brainless Muslims. Tell me Skorpio, did you ever study Islam and how it came about or even study the Coran? Evidently not! McCain, the senile idiot/traitor seen during a photo-op flanked by known terrorists including the flunky FSA mass murderer, Salim Idris. SyrPer has just learned what has been suspected all along: Senator John McCain is receiving money from Saudi Arabia for backing the Saudi obsession with ousting Dr. Bashar Al-Assad. This information has several sources. The first is Chinese Intelligence which picked up open telephonic conversations between McCain and Bandar Bin Sultan, the disgraced Saudi head of the National Security Committee who has been effectively fired as evidenced by his sudden removal to the U.S. for “medical purposes”. The Chinese relayed their intelligence to the Russians who then informed Syria’s General Security Agency and Lt. General Abbas Ibrahim. John McCain is recorded negotiating with Bandar “sufficient amounts” to compensate him for work in convincing Congress of the need for the U.S. to both arm the terrorists fighting the Syrian government and to attack Syrian military bases, especially airbases to blunt the successes of the Syrian army on the ground. Lt. Gen. Issam Hallaq, Chief of the Syrian Air Force, was informed about this. $5,000,000.00 first with the balance to be paid upon an American air assault on 10 SAAF bases which Bandar actually named. McCain asked Bandar whether he wanted to have “Assad bombed in his bunker”? Bandar replied that he would view that as a definite “winner”. That was the word he used, a “winner”. My source says that McCain did not want to deposit money in a Saudi bank but that the situation with Switzerland was “dicey”. He told Bandar that he would inform him as to his preference once he knew the 5 million was deposited and he had had the chance to explore bank options in Panama or the Cayman Islands. Bandar is said to have suggested the Isle of Man in England. The Saudis also discussed other avenues to help McCain. According to my source, Bandar has exploited his relations with Mossad to prepare the groundwork for a deal with AIPAC, the American “Israeli” Political Action Committee. It was Bandar’s hope that the Zionist lobbying and financing group would give McCain much-needed help for the next elections in Arizona where he is now extremely vulnerable. It was Bandar’s plan to have money siphoned into McCain’s coffers through AIPAC in order to avoid strict American campaign funding laws and an older treaty between King Saud and the U.S. which bluntly prevents the Saudis from interfering in the internal affairs of the U.S.
None of this should surprise you. McCain’s outrageous behavior can only be explained by a personal financial interest. The man has no moral background which could flesh out his bizarre actions during a Senate Armed Services Committee meeting convened to hear Syrian Christian clergymen describe the horrors that Christians in Syria are facing at the hands of McCain’s terrorist heroes. McCain barged into the meeting and conducted himself so brutishly that his ally in sending weapons to Al-Qaeda, Sen. Lindsey Graham of South Carolina, had to apologize to his nonplussed guests. Judicial Watch thought the bias on the part of McCain was due to his relationship with humiliated fake scholar and outed hypocrite skag Elizabeth O’Bagy. That is not correct. You now know why McCain is doing what he is doing and why he hired O’Bagy, after she was fired from her former job. McCain has betrayed the people of the United States. He is, just as a citizen of Arizona, said, and right to his face during a town hall meeting: “Mr. McCain, you are a traitor”. But, there’s more. Bandar has now been defanged and McCain has found himself adrift with unearned money he can’t declare. McCain is reported by my source to have established contact with Bandar’s brother, Salman Bin Sultan, who heads the Saudi General “Intelligence” Agency. Salman is said to have soured on the deal which McCain wants very badly. Salman supposedly promised to resurrect the arrangement when he sees that McCain has had some success in convincing Obama to use American naval and air power to emasculate Assad. Hence, the childish display in the Senate AFC. We will have more on this as information arrives. Thank you, Denman. We can all use this information but unfortunately there are a lot of ignorant people here who believe what this nut job John McCain says and the myth about the SFA being "freedom" fighters. ITS ONLY a small minority that are like this most muslims are peaceful and want a good life especially the younger generation I believe that what we are seen now is the death rattle of the extremists who want to stop the progression of Islam . What planet are you living? Not on this one, islam have been producing, for the last 1400 years, only: hate, death, destruction and stupidity. They are the fastest growing group on the planet and add the least; there is not one muslim, educated in the muslim world that got a Nobel prize for science or medicine. They have been living of the civilizations they conquered, they are still doing that. Islam is the cancer of the human race and should be treated like that. It should be banned in ALL western nations and its followers deported. There is no place for islam or muslims in any democratic country. So it seems Sunni-Shiia sectarian conflict is radicalizing a lot of people which is posing threats of spilling the conflict and its side effects to the whole World. This is why sober countries should do whatever possible to stop the war activities before it spreads beyond Syrian borders which is already happenning. Al Qaeda trying to recruit Americans in Syria? Highly unlikely since most of these bozos go over there for the purpose of joining the Syrian "Free" Army and therefore help the right-wing thugs in Washington gain control of that country by proxy! Some missed the memo, THE BIGGEST LIAR OF THE YEAR said they were on the run !!!! There are about 15.000 "western "muslims in Syria fighting for both sides, the western countries can expect a wave of attacks in the western world from these jihad clowns. Hope they kill ten thousand westerners, no western "leader "can call islam a religion of "peace "anymore. It's a cult of : hate, death, destruction and stupidity. Your Obummer is supporting these clowns, get ready for the next wave of attacks on your country and your culture. Unless Al-Qaida and ALL radical Muslims convert to Christianity or to any other religion except Islam, nothing is going to change. The Satanic Verses of the Qu'ran and prophet Mohammed's highly immoral, cruel, perverse and discriminatory conduct will be the role models for millions of brainless Muslims. I do not know what give u the right to give judgments and waiting for a muslim to do something wrong to judge the whole religion. Why do we do for Hitler or Serb , are not they Christians? He's an islamophobe.But after seeing how muslims act and what they believe in,it's easy to become an islamophobe.That's why I'm one,too. Mohamed, the most notorious terrorist was the who started Islamphobia and he should be sued. Mercy? Interesting choice of word. Why not love or tolerance. The Koran is bad rip-off of the equally bizarre bible. Every page of the Koran threaten non believers with hell fire. That is cosmic blackmail, and no decent god would do that to its creations. Every page is filled with the self-congratulations of a seeingly insecure god, which insecurity seems to me to be a contradiction of the concept of a god that is supposed to be all-wise. I mean, why all the threats? That is hardly a kind or secure god. And why would a god create anything, anything at all if it already knew what each creature was going to do or not do as the Koran claims this god does. It is a contradiction. The Koran, by the way, was written over many years by different men. And I never read such nonsense in my life.! I also cannot understand how a billion humans today would believe someone who, 1,300 years ago, said a god talked to him while he was alone in a cave (handily, no witnesses). I mean, how gullible can people be? Is this collective delusion? Or is it the threat of being killed if one doubts the story the method that makes people believe the unbelievable? Pal, your Koran is just like Mein Kampf from Adolf Hitler, it only spreads: hate, death, destruction and stupidity. It makes your sort the parasites of the developed world, you produce nothing, are nothing and never will be anything but brain dead zombies. Why do you think the arab world is so backward and has nothing to offer for its citizens? No Pal, your cult is a cancer for your people. ..........What FOR?............The Tea Party is doing a GREAT JOB of sca REWING up the USA. Perfect don't blame the wusses in the white house, do what Obammy does , he now blames fox news, your a little behind, first it was Bush, then the repubs, than the tea party, pls try to catch up Obammy is blaming fox for everything now !!!! It must be interesting to make up lies as you do. Thank you, Parivel. You said it all! Fortunately, most people are too smart to believe total nonsense like what you wrote. Islamists were created by Islam, not the West. You must be a muslim, living in a western nation on welfare. Why are all these muslims coming west? You have nothing to offer, you are nothing, you produce nothing, you are the parasites of the western world. There is not one muslim, educated in the muslim world that got a Nobel prize for science or medicine. Without the western world you would be living like you did 1400 years ago. Islam is the source of your problem and the guy who looks at you every morning in the mirror. No US politician called for arming/helping the extremist factions, and the fact that it could be a by-product of helping the secular factions is why we never got directly involved. This is a complicated matter and dumbing down/misinforming to help your own "side" is bad for political discourse and bad for the country. 2. Pedophilia (60 yr old man can marry 9 years old girl). 3. Woman r half value of man in court.. I've seen you post this numerous times. I can't figure out if you're promoting Islam or speaking out against it. Try reading the koran, ALL muslims are to kill every person, if they don't surrender and become a dhimmy ( second class citizens ), specially people of the "book ", Christians and Jews. During it's conquest islam has killed around 270 million people and counting. An "extreme "muslims will say: "kill all infidels " a "moderate "will whisper : GO AHEAD !! Islam stands for : hate, death, destruction and stupidity. It makes it's followers the pariahs of the world. Obama is chipping in some aid to Alqaeda by supplying arms and money to them in Syria. Funded by American tax dollars. What a clever president the USA has! It is always fun to read your bare-faced lies. What a talent you have for lying! Obama is killing alqaeda members with drones, but you say he is arming them. Yeah, he drops bombs on them, you mean. No we are OK. Edward Snowden will keep us safe! So are John McCain and Lindsey Graham complicit in this since they posed for pictures, arranged for weapon transfer, and funneled money to these "Syrian Rebels"? McCain and Graham are Progressives like Comrade ZerO but they have R`s after their names. ZerO invites the Muslim Brotherhood in to the White House who he crawled into bed with and supported for his disastrous Arab Spring which has turned North Africa and the middle East into a complete Charlie Foxtrot all they way into Syria! The Syrians in exile are fleeing from the murdering Islamic Jihadists not Assad! Al Qaeda, Al Sharia, Al Nusra Etc. are all the spawn of the Muslim Brotherhood. i thought obama said al-qaida was defeated. i thought POTUS said he defeated al-qaida…..
the battles of the Islamic state in Iraq and the Levant. Yes how wonderful, and Obama keeps sending money there(Syria)..........our money. Islam religion of "Peace" except if you are a non-Muslim then "Death to the infidels!" I understand you are not at all educated in the ways of the world and only educated in the ways of man as animal, but are you kidding me? ha ha ha ha ha ha ha ha never happen, o, maybe your random psychopath – and really, we would be better off without some random psychos in our midst. You were kidding us right?